As you may or may not know, Stickley Furniture is an American made furniture producer who designs and creates pieces that are truly treasures for decades of ownership. (Often on their Facebook page they include “Stickley Stories,” which are interesting anecdotes from customers, both from years ago and today. Check them out! They’re fun reading.) Back to the point—each year Stickley unveils a collector piece and for 2015 they’ve designed a piece we are THRILLED to add to our own collection. Introducing the 2015 Stickley Collector Edition Gus Woven Leather Bench. This gorgeous bench incorporates a blend of rich leather, nail head trim, pinned tenons and the extremely versatile opportunity to beautify literally any area of your home. The variation shown above is the Onondago finish. It is also available in solid quartersawn white oak or cherry in a variety of specially hand-rubbed finishes. 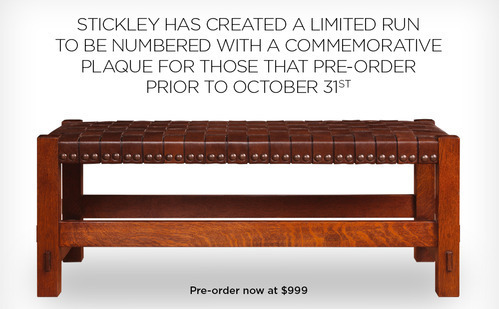 Stickley’s annual collectors edition is available with a numbered plaque for a limited time and number only. Don’t miss your chance to own this treasure! TO PRE-ORDER: click this link, complete and submit the pre-order registration form. You’ll receive an authorization code via e-mail, which you’ll print and bring to Batte Furniture and Interiors by Friday, October 31. The commemorative bench will begin shipping January 2015.